Sepsis remains the most important cause of AKI in the intensive care unit (ICU) with 15%–20% of patients with sepsis-associated AKI (SA-AKI) prescribed RRT (1). In addition to association with short term mortality, AKI is also linked to the later development of CKD, ESRD, and long-term increased risk of death (2). In ICUs, abdominal infections are the commonest association of SA-AKI (3). However, in instances where AKI develops in the context of sepsis, other risk-factors often coexist (3), complicating assessment and management. Despite its importance, treatment recommendations for SA-AKI (4) and AKI in general (5,6) are not sophisticated, emphasizing prompt and effective treatment of underlying infection, avoidance of secondary kidney injury, and optimization of systemic hemodynamics. There is, therefore, continued reliance on clinical experience to guide bedside management. A 65-year-old man is brought to hospital with a 2-day history of nausea, vomiting, and abdominal pain. Past medical history includes ischemic heart disease, type 2 diabetes with microalbuminuria, hypercholesterolemia, and hypertension. Medication includes Ramipril, Clopidogrel, Amlodipine, Bisoprolol, Atorvastatin, and Metformin. He is sweaty, tachycardic (heart rate 115), and has cool peripheries. His central temperature is 38.2°C, BP is 95/55 mm Hg, respiratory rate is 30, and oxygen saturation is 98% on nasal oxygen. He is disorientated in time and place with a Glasgow Coma Score of 14 (E4, V4, M6). There is tenderness in the right upper quadrant with localized guarding. His partner reports he has not passed urine that day and he is subsequently catheterized with residual urine of 120 ml. Arterial blood gases demonstrate pH 7.30, base excess −12 mmol/L, lactate 5.5 mmol/L, partial pressure of oxygen 120 mm Hg, partial pressure of carbon dioxide 30 mm Hg, sodium 130 mmol/L, chloride 104 mmol/L, glucose 290 mg/dl, and capillary blood ketones are negative. Following Surviving Sepsis guidelines (7), 30 ml/kg of intravenous crystalloid is rapidly administered, blood cultures obtained, and intravenous piperacillin-tazobactam is administered. Systolic BP remains <100 mm Hg. In view of his abdominal signs and lactic acidosis, a CT scan of the abdomen with contrast is performed revealing dilated extra- and intrahepatic bile ducts and multiple stones in thick-walled gall bladder. First serum creatinine is 2.3 mg/dl (outpatient baseline 1.1) and potassium is 5.1 mmol/L. Urine output is 15 ml in the first 2 hours and repeat lactate is 4.5 mmol/L. He is referred to gastroenterology for management of his obstructive cholangitis and critical care for ongoing supportive management. Sepsis definitions have recently been simplified and refined (8), and sepsis is now defined as “life-threatening organ dysfunction caused by a dysregulated host response to infection.” In this patient there is suspected biliary infection and the presence of sepsis, with associated risk of prolonged ICU stay or death in hospital, which can identified by virtue of a quick-Sequential Organ Failure Assessment screening score of ≥2 of 3 (alteration in mental status, systolic BP <100 mm Hg/vasopressor requirement, and respiratory rate ≥22/min) (8). Furthermore, the patient has septic shock (8), defined by having sepsis syndrome together with persisting hypotension requiring vasopressors after volume resuscitation or a lactate level >2 mmol/L: a group where hospital mortality is >40%. Finally, he has stage 2 AKI by the Kidney Disease Improving Global Outcomes (KDIGO) classification of creatinine criteria (5) and has been significantly oliguric (likely stage 2–3 by urine criteria). Importantly, in the context of acutely rising creatinine, any assessment of AKI severity on the basis of a creatinine measurement at a single point in time could underestimate the true extent of decline in kidney function. In this context, AKI is likely both a marker of disease severity and a direct contributor to adverse outcomes, through adverse effects of AKI on homeostasis and distant organ function. This life-threatening illness requires two-pronged management: source control of sepsis (drainage of the obstructive biliary system and antibiotics), accompanied in parallel by intensive monitoring and multiorgan support in the ICU (Figure 1). Etiology of kidney dysfunction is likely to be sepsis, but contributions from medications, hypovolemia, poor cardiac response, and loss of kidney reserve in early diabetic nephropathy (baseline CKD stage 2–3) are all plausible contributors. Radiologic contrast exposure occurred after onset of AKI, but could contribute to AKI progression; however, the best diagnostic imaging should in general be obtained to allow definitive treatment of a life-threatening underlying condition (6). Similarly, although exposure to nephrotoxic antibiotics should be minimized, this can be outweighed by the need to cover the likely underlying infection, especially when prevalence of community-acquired, multidrug-resistant gram-negative bacteria is high. Importantly, early, appropriate antibiotics with source-control have been shown to lower risk of AKI (9) and speed AKI recovery (10). In this case, best management of SA-AKI (5) is encompassed within good ICU care of septic shock: resuscitation guided by invasive hemodynamic monitoring and mechanical organ support if clinically indicated. Nephrotoxins should be avoided, but not if essential for management of the underlying condition. Drug dosing should be modified in the context of kidney dysfunction, but, because loading doses are dependent on volume of distribution, this may not apply in the first 24 hours. 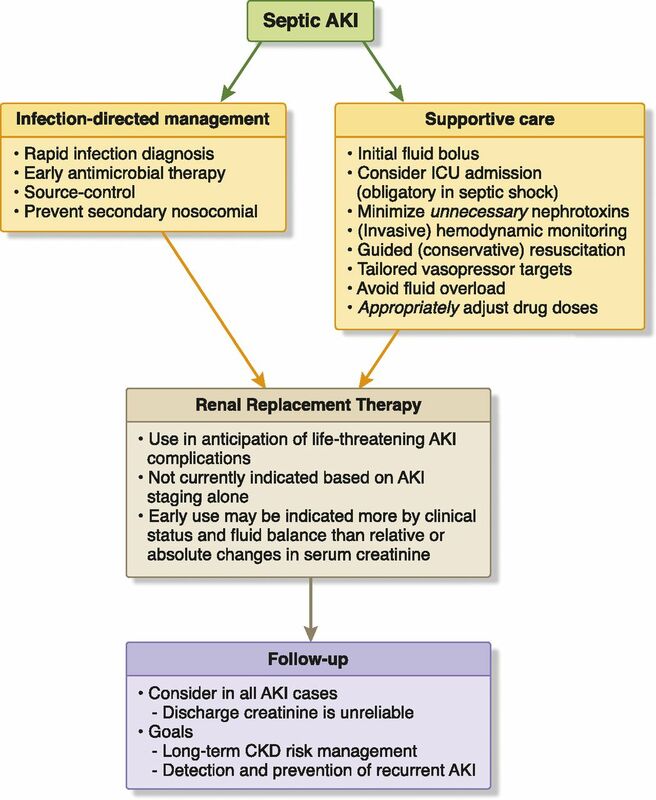 Parallel and sequential steps in the management of sepsis-associated AKI. Successful management of sepsis and its complications requires both adequate treatment of underlying infection in parallel with provision of good supportive critical care, and escalation to artificial organ-support, including RRT, when clinically indicated. Treatment of infection-induced critical illness concludes with follow-up to detect long-term consequences of acute organ injury, such as development of CKD after AKI. ICU, intensive care unit. During resuscitation, it is critical to balance the need to restore normal hemodynamics while minimizing the adverse effects of fluid overload. In general, need for fluid resuscitation is predicated on both the presence of inadequate cardiac output for good tissue perfusion and a significant, sustained increase in stroke volume with filling. In numerous studies in critical illness, absolute and relative change in central venous pressure have not been shown to reliably predict cardiac response to fluid challenges or to improve outcomes, and central venous pressure targets are no longer recommended in the treatment of septic shock (7). Similarly, no improvement in kidney outcomes occurred with early goal-directed therapy in three major sepsis studies (4), suggesting any role of cardiac output monitoring is more to indicate that fluid is not required as to drive ongoing fluid-loading. Importantly, fluid overload has been consistently associated with worse outcomes in the context of established AKI (11), and a recent pilot study has suggested that more restrictive resuscitation in early septic shock may be associated with better kidney outcomes (12). In addition, most cases of human SA-AKI occur with hyperdynamic, vasodilatory shock, where inflammation rather than global kidney ischemia drive pathogenesis (13). Thus, after initial bolus, further fluids may be given if hypotension and shock is ongoing; however, once >2–3 L has been administered, measurement of cardiac fluid-responsiveness is essential to avoid unnecessary, potentially harmful therapy. Finally, fluid composition continues to be controversial; undoubtedly, hydroxyethyl starches should be avoided in the context of sepsis, but the relative merits of colloids in the form of albumin and buffered versus unbuffered crystalloid solutions remain debated, without definitive evidence. Given these concerns, vasopressors are the mainstay of refractory hypotension management in the complex setting of SA-AKI. Norepinephrine remains the international drug of choice; early use of vasopressin in septic shock was not associated with improved primary kidney outcomes in a randomized trial, but there was potential benefit in lesser need for RRT and no apparent harm (14). BP targets may be individualized: in a subgroup analysis of a large trial (15), mean arterial BP (MAP) target of >80 mm Hg was associated with less RRT in patients with preexisting hypertension; however, because there was no survival benefit, if higher targets are adopted, they should be reviewed if vasopressor requirement is high, or RRT is commenced. The patient is admitted to the ICU, and an additional 2 L of crystalloid is administered together with boluses of ephedrine while arterial and central venous lines are inserted with a calibrated pulse-contour cardiac output monitor. He becomes increasingly agitated and hypoxic, requiring intubation and ventilation. Cardiac index is 2.9 L/min per 1.73 m2 and norepinephrine is commenced, initially targeting a MAP of ≥75 mm Hg on the basis of prior history of hypertension. Fluid challenge demonstrates no increment in stroke volume and further fluids are not administered. Piperacillin-tazobactam was given at 4.5 g three times daily in the first 24 hours. A radiologically guided percutaneous transhepatic biliary drain is requested for source control of presumed biliary sepsis. Over the next 6 hours, norepinephrine at 0.5 µg/kg per minute is required to achieve the MAP target, and 0.02 U/min of vasopressin is added; however, urine output remains 5–10 ml/h and lactate 3 mmol/L. The MAP target is therefore revised to 60 mm Hg due to high vasopressor requirement and lack of diuresis response to a higher MAP target. After return from interventional radiology, an evaluation is made regarding ongoing management. The presence of persistent oliguria after initial resuscitation faces clinicians with a choice between watchful waiting, addition of diuretics to manage fluid balance, or direct institution of RRT. Classically, RRT is indicated for severe refractory uremia, hyperkalemia, acidosis, or fluid overload causing organ impairment. Organ support should be given in anticipation of immediate threat to life. Thus, in critical illness, RRT is usually instituted on clinical judgement rather than on absolute indications. Two recent studies have examined KDIGO AKI criteria for the initiation of RRT in the ICU: a single center study suggesting benefit from commencing at stage 2 versus stage 3 AKI in a predominantly surgical population (16), and a larger trial with predominantly SA-AKI showing no benefit from initiation at stage 3 AKI versus conventional criteria (17). The problematic aspect of these studies and ongoing RRT-timing studies is that AKI diagnosis on the basis of an isolated measurement creatinine doesn’t accurately reflect underlying GFR when creatinine is rising due to lack of steady-state. Furthermore, during critical illness and sepsis, creatinine generation decreases rapidly so that, in two patients with similarly decreased kidney function, creatinine is likely to rise more slowly in the sicker patient. Urine output may be a better guide because oliguria-anuria implies a very low-level kidney function and predisposes to progressive fluid overload. Thus, consensus AKI diagnostic criteria, designed to categorize complete patient episodes by peak creatinine or maximal oliguria, may not be the best guide to dynamic decision making about RRT in real-time. On assessment, our patient had urine output <0.5 ml/kg per hour for at least 9 hours, with repeat creatinine 2.6 mg/dl, urea 30 mg/dl, pH 7.31 (after sodium bicarbonate), and potassium 5.4 mmol/L. Although he is not difficult to mechanically ventilate, cumulative fluid balance since admission is now +7 L after peri-procedural fluid therapy. He remains on high doses of vasopressor, lactate is 3.1 mmol/L, and cardiac index is 3.5 L/min per 1.73 m2, consistent with vasodilatory shock with limited cardiac reserve. Level of lactic acidosis does not suggest Metformin toxicity requiring RRT in isolation. Although no absolute RRT indication is present and AKI based on creatinine and charted urine output is only stage 2, the likely clinical course seems clear. Importantly, in the context of refractory oliguria, progressive fluid overload is probable, with its multiple adverse associations. A diagnostic challenge with diuretics might have been considered in a less acutely unwell patient; however, for this patient RRT was deemed clinically indicated and was not further delayed. Postdilution continuous veno-veno hemofiltration was commenced at a dose of 25 ml/kg per hour using citrate anticoagulation. Initially, net fluid removal was not attempted, with ultrafiltration adjusted to actively control on-going fluid balance and minimize further fluid sequestration (18). Over the next 3 days, clinical condition stabilizes and accumulated fluid overload is progressively resolved with continuous RRT. Sensitive Klebsiella pneumoniae is grown from blood. RRT is discontinued on day 7; however, recovery for critical illness is prolonged. At hospital discharge (day 60) creatinine is low-normal at 0.65 mg/dl. Importantly, after prolonged hospitalization serum creatinine may be a poor indicator of kidney recovery and overall prognosis (19). Thus, follow-up measurement of renal function forms the final stage in AKI management (20). Dr. Prowle reports receiving speaker fees and travel from Baxter Inc. and Nikkiso Europe GmbH and serves as a consultant for Nikkiso Europe GmbH.